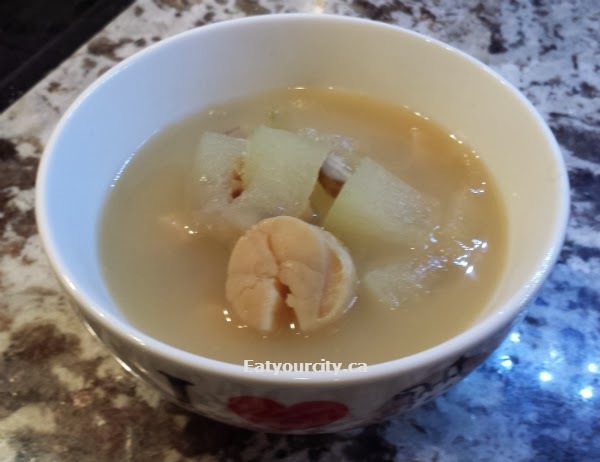 Posted by I was initially a bit hesitant at making Traditional Chinese soup. But then I know they do taste fabulous as we've had it at Chinese restaurants in the past, plus, they're good for you as ingredients in Chinese traditional soups are added on purpose to promote or balance out something in your body. 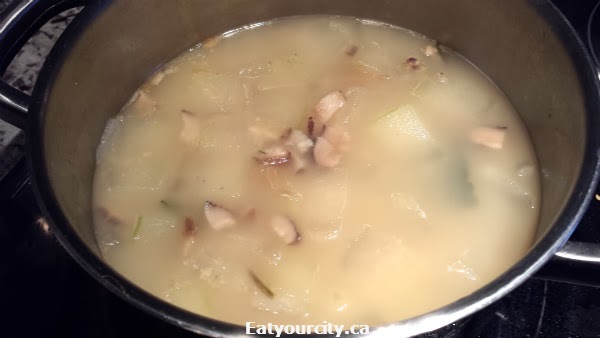 In the case of the traditional Chinese winter melon soup, this mild and slightly sweet gourd is low in calories and is supposed to help ward off colds. Its also called ash gourd for its dusty green skin appearance (though lots of places wash and then apply edible food safe wax for a nice deep shiny green appearance). In India, the ash-gourd is offered to the gods in religious ceremonies and considered to be effective in warding off evil spirits and the evil eye. Well, that's never a bad thing, but lets get cooking! 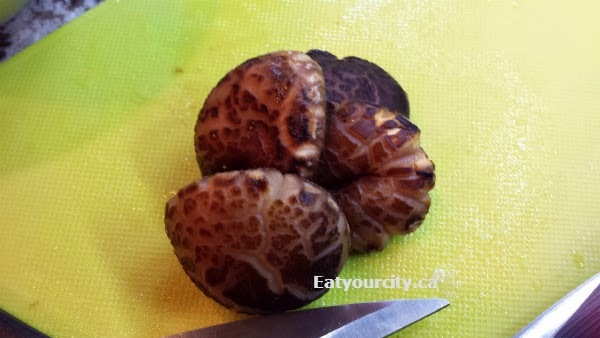 First off, rinse your dried Chinese mushrooms and soak in a cup of cool water. I sometimes weigh the floating mushrooms down into the water with a bowl to help speed up the hydration process. The same goes for the dried scallop. 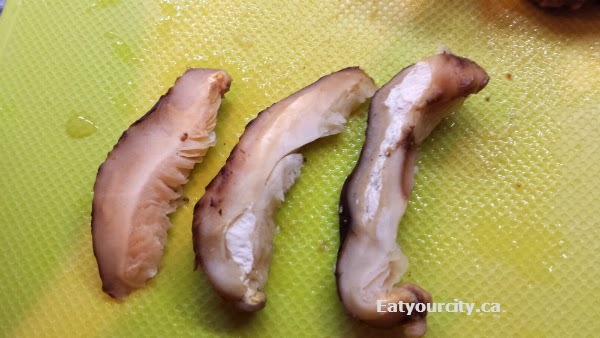 Both the mushrooms and dried scallop need to be rehydrated prior to cooking unless you want to chip a tooth. The mushrooms add a rich earthiness to the soup, while the scallops add a seafoody savory unami to the soup. Time to chop it up! How big is really up to your preference. The larger it is, the longer it'll take to cook. 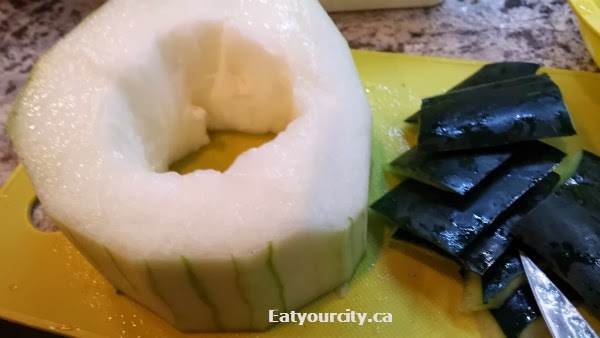 I've seem some restaurants just hollow it out and toss the whole thing in so later, the melon is the edible "pot" that holds the soup. I like cutting it into 1-1.5 inch x 0.5 inch pieces so it doesn't turn to mush if I let it simmer on the stove and forget about it. 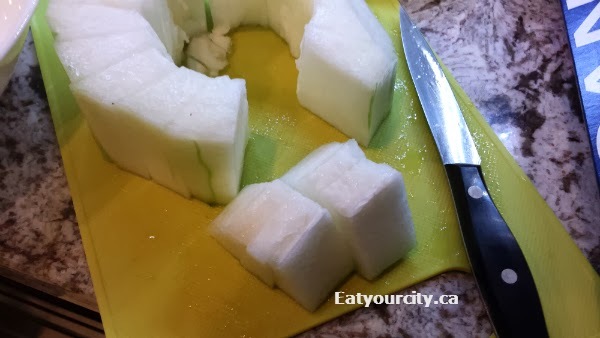 Setting the cut up melon aside, its time to chop up the rest of the ingredients! First up is the Chinese mushrooms that have hopefully soaked and hydrated for at least 30min. Slice, dice and chop them suckers. 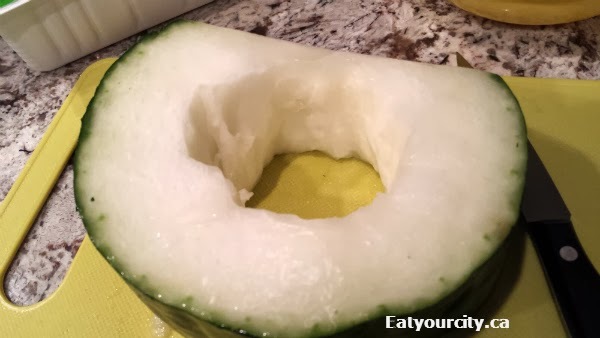 Its no big deal if they are rock hard, but it does cut down cooking time, and safer and easier to slice up when they're fully hydrated rather than not. The piece on the left is good to go, the piece in the centre still has unhydrated hard centre, and the one on the right is what you get if you just barely kissed the mushroom with water. 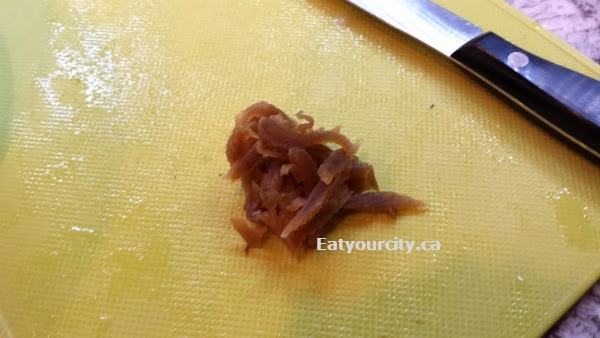 Next, slice up about 1 teaspoon worth of salted preserved cabbage after rinsing it really well. 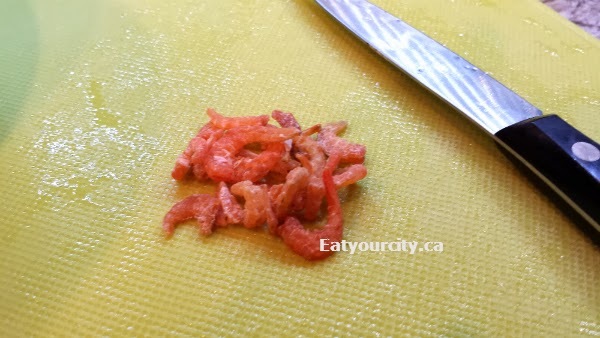 This is an optional ingredient as it adds in a touch of salt and unami. I always leave prepping meat until last on the cutting board - to reduced cross contamination, and plus, I'm lazy/efficient (take your pick!) and don't like to wash my cutting board and utensils more than I need to. 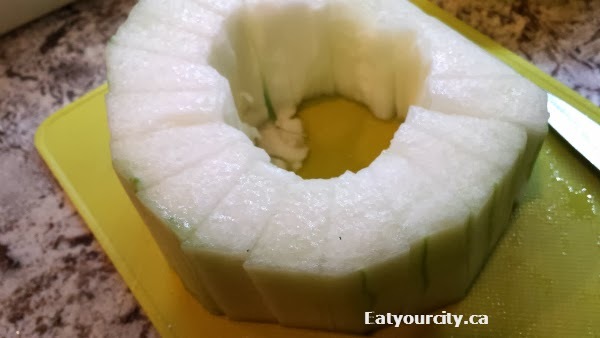 Again, like the winter melon, whether you like your pork as diced, ground up or in slices is up to personal preference. 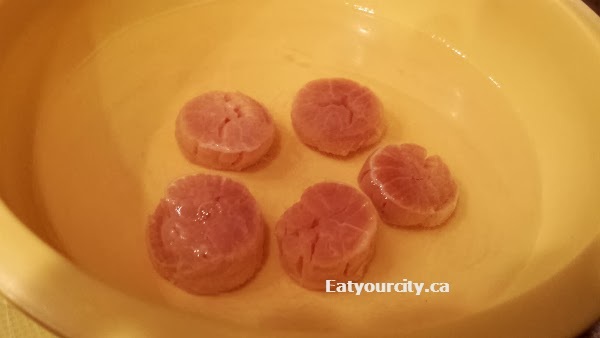 I chose to dice it up, then toss with a touch of salt, wine and oil. Now that all the prep work is done, bring to a boil a pot of chicken broth (low sodium or homemade - mine's homemade, that's why its so milky looking), and then dump in all the ingredients. Don't forget to add in the water the scallops were soaking in as well as the water the mushrooms were soaking in! 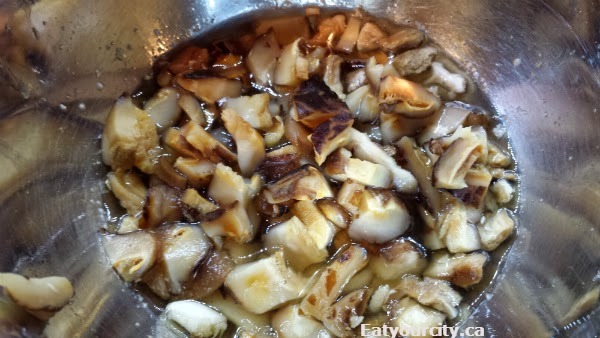 Simmer for about 20 minutes until the winter melon is translucent and dried scallops are no longer hard and are starting to fall apart. Enjoy! 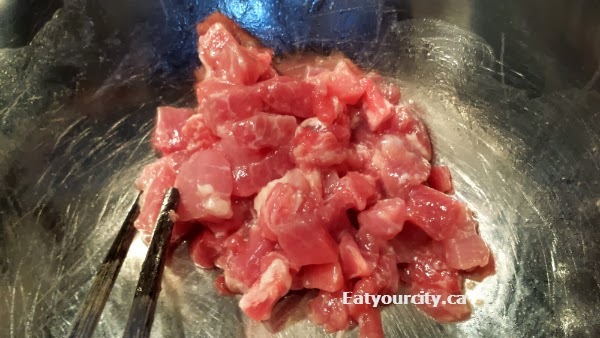 2) Add in all ingredients and bring back up to a boil. 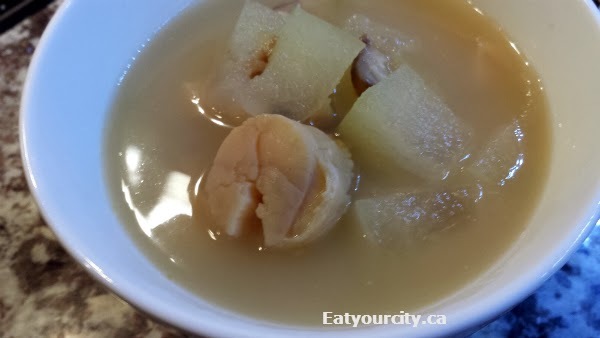 Simmer for 20minutes or until the winter melon is translucent and dried scallops are no longer hard and are starting to fall apart. Enjoy!